The Abridged: An oldie but a goodie. Jaipur's first heritage hotel, Samode Haveli has been welcoming guests for over twenty years. Still one of the best hotels in town, the Pink City is quite literally on your doorstep. 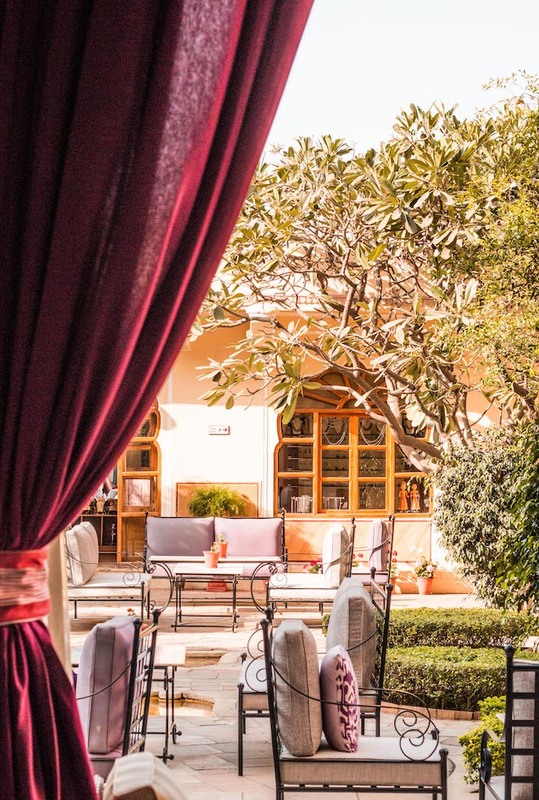 Welcoming the discerning traveller to Jaipur for decades, Yadavendra Singh and family have created quite a name for themselves in the hotel industry in India (as though they didn't already have one). The family's ancestral property, Samode Haveli is one of the oldest, and finest examples of a Rajasthani haveli. It's rooms are a rabbit's warren of winding corridors and staircases (and if your sense of direction is as bad as mine it'll take you the first 24-hours just to get your bearings). Enter up a former elephant ramp, though sadly Toyata Innova is now the preferred mode of transport in Jaipur, to receive a hearty welcome by Heman Singh, Samode Haveli's doorman, who's been greeting guests at the hotel for as long as most remember - and never forgets a face. Never intended to be a hotel, Samode Haveli's 39 rooms differ in shape and size. All include dreamy slipper bathtubs and large power showers. Monochrome tiles inject some timeless glamour, and family portraits, hung from the walls ground the property in its history. The two Sheesh Mahal Suites are a spectacle to behold. The former king's and queen's quarters they are covered floor to ceiling with intricate 150-year-old murals and intricate bejewelled mirror work. There truly is nothing else like them, and with the craftsmanship no longer available, there never will be. Though some might find them a little claustrophobic, do try and sneak a peak at them if they're available. And if you decide to book it? You're sleeping amidst history. A concerted effort has been made with the menu at Samode Haveli, so it is far from the usual heavy North Indian spread you'll find across your travels in Rajasthan. Caprese salads by the pool, salmon with wasabi mash, and traditional Indian dish of the royals, Laal Maas. In fact the menu is always changing, as Samode Haveli has plenty of repeat customers, so you'll find something new almost every time you visit. Owner Yadavendra is also very particular about his wine, and they house quite the wine cellar (far better than the usual fair in India) to be paired with your meal. Cheers to that. Boasting arguably the best pool in Jaipur, this azure waterhole is the place to be on a hot Jaipur afternoon. Get their early and bag a daybed. The hotel also offers so excellent programmes such as their early morning walk. Set off at 6 am and watch the city come alive. You couldn't be further from the tourist haunts of Jaipur, this is experiencing The Pink City like a local. Highly recommended. The perfect guest: First timer's to India, interior designers bulk buying fabrics, heritage lovers. There are few that wouldn't like Samode Haveli. Rates: From £100 per room per night. Inc. Breakfast, Exc. Taxes.